Patsy has been teaching for many years and enjoys helping students, whether beginners or more experienced artists, to realise their creative potential. With a friendly, relaxed and patient teaching manner, Patsy encourages her students to draw and paint in their own personal style, while demonstrating and explaining how an understanding of techniques and materials can make the process simpler and more enjoyable. She is a great believer that, however figurative, a painting should be an adventure, approached with courage, an enquiring mind and a sense of humour! Patsy runs One-to-One watercolour and drawing classes in her studio, the timing and content tailored to suit the needs of the individual. She also gives demonstrations to art societies and groups and runs watercolour classes onboard cruise ships. 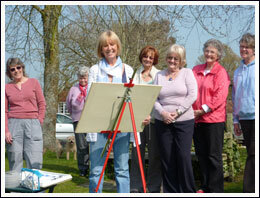 Over the years, Patsy has organised a variety of group painting holidays, at home and abroad. A week in Venice with daily sunshine, a delightful villa set in its own walled garden, with delicious al fresco evening dining, was possibly one of the most memorable! Yesterday I spent a very enjoyable day at Patsy Moore's art workshop in Wisborough Green - an ideal venue. Having watched a helpful demonstration, received advice on my own painting from Patsy, eaten a lovely lunch (included) with homemade bread, all prepared by Patsy, I felt that I had spent a very beneficial day.